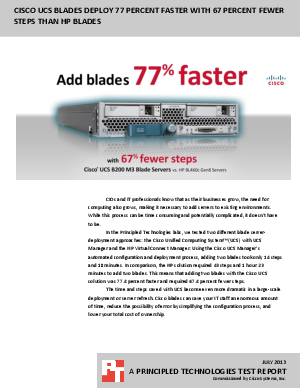 The time you save with the Cisco UCS solution's automated process can quickly add up when you are implementing a large-scale blade server deployment. By choosing the Cisco Blade Servers, your IT staff can save days or weeks - time much better spent on other projects. Less time spent on routine tasks means that IT orgainizations can spend more time on values added activities, enhancing business productivity and success.